The Gator 1 Card makes campus life easier. Students and staff use the Gator-1 Card for fare-free access to the RTS bus service; to use UF Library services; to access prepaid Vending, Gator Dining, and Bookstore accounts; and to obtain many other campus services. ID Card Services (also called Gator 1 Central) is located on the ground floor of the UF Bookstore & Welcome Center. To obtain your Gator 1 Card, bring an official Photo ID (Passport or Driver's License) and $15.00 (cash, check, Visa, AmEx, MasterCard, Discover, or debit card). Employees must obtain a Staff and Faculty Authorization form from their department payroll administrator or office manager in order to receive new or replacement Gator 1 Cards. 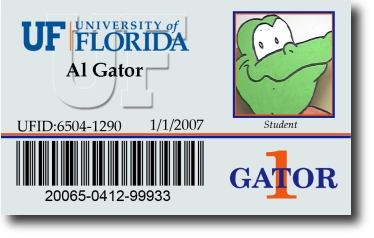 Once the form has been completed (including payment information) and signed at the department level, the employee should bring the completed form and a picture ID to the ID Card office to receive a Gator 1 ID Card. To authorize an employee to obtain a Gator 1 Card, authorizers in the employees department must submit a request to be setup as a Gator 1 Card department authorizer by emailing idcardbilling@bsd.ufl.edu. If the department would like to use unencumbered billing to pay for employees cards, they must also submit a request to this email address with their chartfield information to be setup for a billing account with ID Card Services. For unencumbered billing, departments will be invoiced monthly. Electronic invoices will be available online at Gator 1 Central.